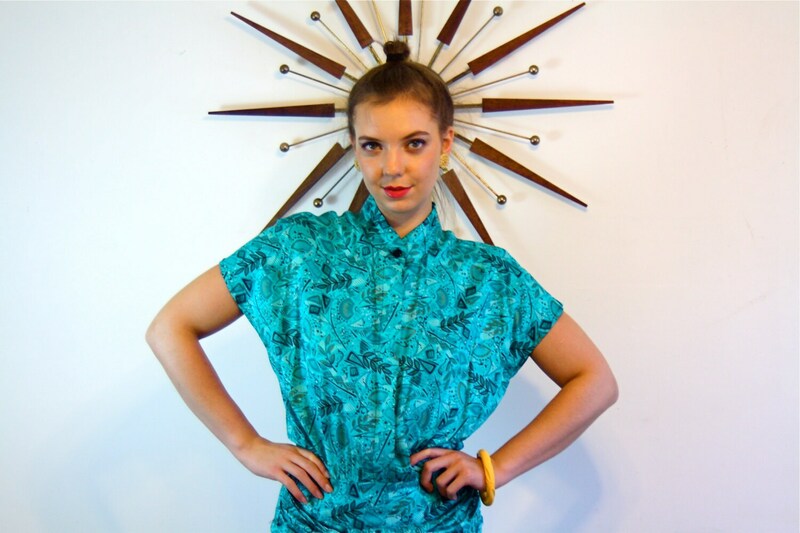 Vintage atomic print 1980s does 40s dress! This beautiful 80s dress has a high Nehru collar neckline and cool twisting and pleating details in the front! This new wave dress is a beautiful turquoise green/blue rayon, with a black and gold print patter of fans and leaves! has front and back kick pleats, and two front pockets. This is a truly a special piece from this era! Model Measurements: bust:32", waist:28", hips:41", height:5'9"
This dress is in excellent condition! Convo me with any questions! Thank you!